7191 X-Wing Fighter is an Ultimate Collector's Series set released in August 2000. 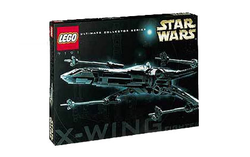 It was one of the first two UCS sets, along with 7181 TIE Interceptor. This set included a standard size R2-D2 minifigure despite the set's status as a UCS set. This astromech size ratio was echoed in a subsequent set. The S-Foil wings can be adjusted so that they rest in either attack or flight position. This is a description taken from LEGO.com. Please do not modify it. The ultimate X-Wing! If you think blasting the Death Star is tough, try building the ultimate X-Wing fighter. With more than 1300 pieces, it is one of the most realistic models in the galaxy. From its engine exhaust ports to the tips of its laser cannons, no detail has been overlooked. Built to perfect scale, the X-Wing has an impressive 20-inch wingspan. Comes with a display stand and detailed spec plate. Ages 14+. 1304 pieces. Facts about "7191 X-Wing Fighter"